I have always been blown away by the works of Heston Blumenthal since watching Masterchef Australia. Heston is an English Celebrity Chef who owns a three Michelin-starred restaurant. It is always a multi-sensory experience when eating his dishes. I was especially blown away when he created this Edible Garden in the last season of Masterchef Australia and got the competitors to replicate his work. 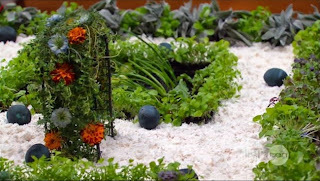 Its not only a piece of art but everything in this garden is all edible!! Yes, believe it or not. What is amazing about Heston's work is that he plays with your mind. Your brain is telling you that you are eating dirt/soil which is actually made from black olives and the rocks are actually potatoes. So anyway, I hope you are as blown away at this guy's talent as me now! I found this video by Heston which I thought I would like to share with you in making the perfect, juicy roast chicken! Enjoy! I will definitely be trying this soon!